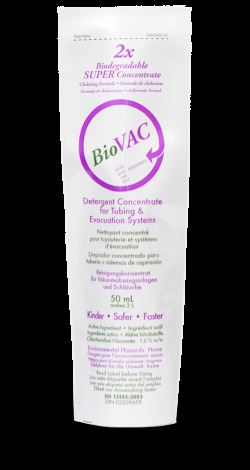 BioVAC is a controlled foam device detergent used to clean suction or evaculation systems that encounter body fluids in clinical situations. This unique formula contains four enzymes that rapidly break down bioload. It has a special low foaming formula that ensures excellent cleaning action without overflow. Please enter a valid quantity to add a product to your cart. © Copyright 2019 Designed by Micrylium Laboratories Inc. All rights reserved.